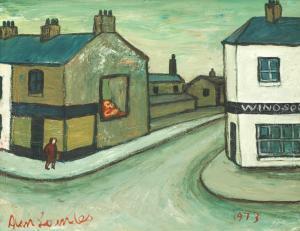 Find artworks, auction results, sale prices and pictures of Alan Lowndes at auctions worldwide. 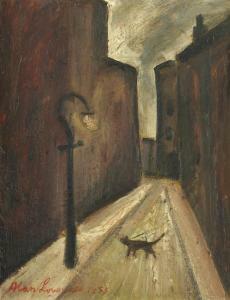 Alan Lowndes (British, 1921-1978) The Prowler signed and dated 'Alan Lowndes 1954' (lower left) oil on board 35.5 x 28cm (14 x 11in). Footnotes Provenance With The Crane Gallery, Manchester Acquired by the family of the present owner prior to 1971, and thence by descent Private Collection, U.K. Jonathan Riley is currently preparing the forthcoming catalogue raisonné of the paintings of Alan Lowndes, in which the present lot and lot 92 will be included. Jonathan would like to hear from the owners of any work by the Artist so that these can be included in this comprehensive catalogue. Please write to Jonathan Riley, c/o Modern British and Irish Art, Bonhams, Montpelier Street, London, SW7 1 HH or email britart@bonhams.com. § Alan Lowndes (British, 1921-1978) Students of Form signed lower left "Alan Lowndes" and dated 1968 oil on board 39 x 29cm (15 x 11in) Provenance: Rutland Gallery, 29 Bruton Street, London, W1 Exhibited: London, Rutland Gallery, Alan Lowndes Retrospective Exhibition, 1972 Other Notes: Alan Lowndes was a British artist who mainly worked in oils and a bright palette to depict the industrial north. 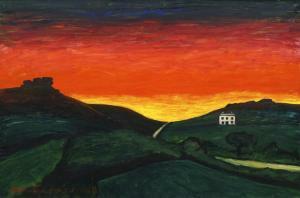 His work has been compared to Lowry's simplistic style and nostalgic depictions, although he is considered by Terry Frost to be the greater painter. He was born to a railway clerk, leaving school at 14 to be an apprentice decorator. 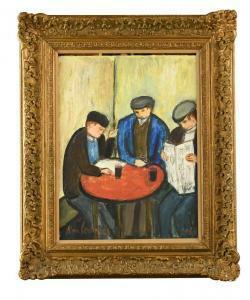 After his time in the Second World War, he studied painting at night school, but was mainly self-taught. He later spent time in St Ives, and was a close friend among many of the St Ives School artists. The present painting will be included in Jonathan Riley's forthcoming catalogue raisonne on the artist. Loose in its frame. Alan Lowndes (British, 1921-1978) The Windsor Arms signed 'Alan Lowndes' (lower left) and dated '1973' (lower right); also titled '(TIGER BAY)/THE WINDSOR ARMS', dated '1973' and inscribed (on canvas verso) oil on canvas 40.5 x 53cm (15 15/16 x 20 7/8in). Footnotes Provenance With Crane Kalman Gallery, London, where acquired by Mr D. J. Mathias, July 1973 Private Collection, U.K.
Alan Lowndes (British, 1921-1978) Fishing Boats, Cornwall signed and dated 'Alan Lowndes 1956' (lower left) oil on board 61 x 121.5 cm. (24 x 47 3/8 in.) Footnotes Provenance With Crane Kalman Gallery, London, 17 January 1986, where acquired by the family of the present owner Private Collection, U.K.